Warracknabeal, a rural town, is in the northern Wimmera region of north-west Victoria. It is 55 km north of Horsham and is at the intersection of the Borung and Henty Highways. The Warracknabeal district was settled as two pastoral runs in 1845, either side of the Yarriambiack Creek, by the brothers Andrew and Robert Scott. The runs were named Werracknabeal or Warracknabeal West and East. It is thought that the name was derived from an Aboriginal word describing gum trees fringing a hollow, or flooded red gum trees. An alternative explanation is a Scottish surname Warrack and ‘nabeal’, Gaelic for ravine. In 1867, as smaller farm holdings were taken up in the district, a shanty and store were opened near the creek on Scott’s pastoral run. Within two years a town was surveyed around the shanty and store, and town allotments were sold in 1871. A primary school was opened in 1873. By 1878 a railway line had been constructed to Murtoa, about 50 km southwards. 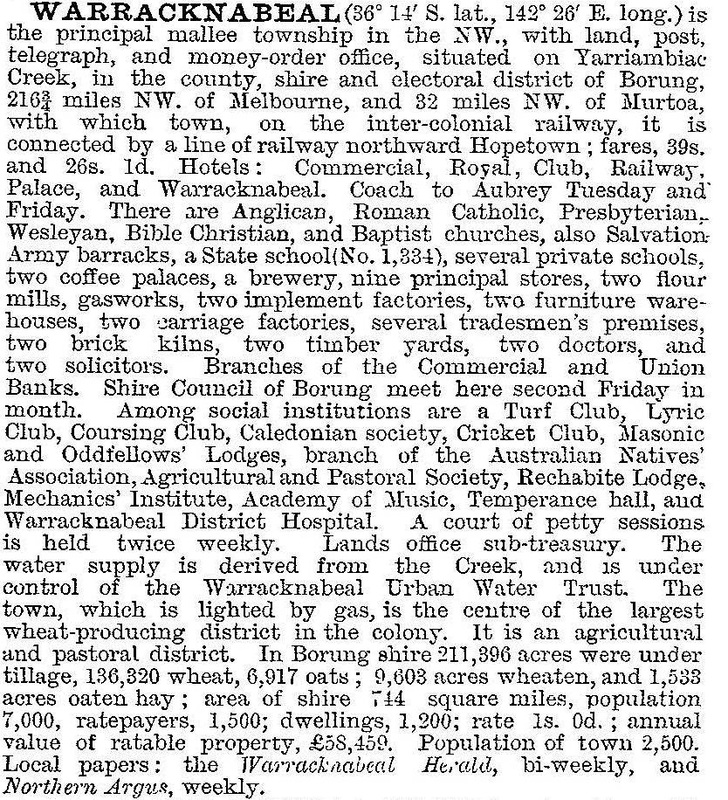 Local interests agitated for various extensions and, perhaps in anticipation of Warracknabeal succeeding, a flour mill was opened there in 1880. Four years later another (Thomas’) flour mill was opened at Warracknabeal, and in 1886 the railway reached there. Thomas’ Warracknabeal Roller Flour mill operated until 1964. It was among the first in Victoria to introduce elevators for lifting wheat (1892). The year before the railway the Warracknabeal Herald was started and the Agricultural and Pastoral Society was established. The railway had Warracknabeal as a terminus during 1886-93. The town was made the administrative centre for Borung shire which was proclaimed on 30 January 1891. In that year Warracknabeal’s population (1313) was six times the figure of ten years before. Water supply improvements were made by the local water trust, redirecting some of the Yarriambiack Creek’s flow to a swampy depression for farm use. (The creek’s source is the Grampians, and it ends at Lake Coorong, Hopetoun). Until farm settlement had extensively reached the Mallee region Warracknabeal was considered to be the capital of the Mallee. It had numerous stores, three of emporium size, two foundries and a large agricultural implements factory. The Warracknabeal Turf Club (1899) reintroduced horse racing, which had lapsed since the first meeting in 1871. Warracknabeal’s Mallee capital status was echoed in several substantial public buildings, including the elaborately ornamental post office (1890), the Commercial and Warracknabeal Hotels (1890), the court house (1891) and the Borung shire offices (1904). All except the last (which was demolished in 1939) are on the Register of the National Estate. The Register also has the four storey cylindrical water tower (1886), with its fine brick and bluestone work. The water tower’s elegance was not equalled by the regularity or quality of the water. The Yarriambiack Creek was prodigal, flooding in 1909 and drying up in 1915. Water was then drawn from a depression which filled by seepage. Typhoid had been a continual worry since 1880, and inadequate drains did not carry waste away. Waste disposal and sewerage was raised to a satisfactory standard in 1908 and decent water supply came in 1918 when water was piped from a swamp which had been excavated a few years before. The dominant religious affiliations in Warracknabeal were non-conforming, particularly Presbyterian and Lutheran. Education beyond Grade 6 was at private institutions (notably Warracknabeal College, 1901-12), until a higher elementary school was opened in 1912. A high school was opened in 1924. Since 1891 there had been a hospital, which opened an infectious diseases wing in 1905. Its doctors were among those who pushed the water and waste disposal authorities into doing something about the contaminated water supply. The shire was much changed in shape and area since the first Borung shire. When first formed Borung’s western boundary was the Yarriambiack Creek. In 1893 it extended westwards, but in 1896 its north and west sectors were severed to form Karkarooc shire. The change of name to Warracknabeal shire was made on 7 September 1938. Apart from the main centre, the two other places of population are Brim and Sheep Hills. Warracknabeal township has undertaken several self help projects. They have included the alcohol distillery, an aerodrome, war service homes (all of which have had limited or no success), the successful conversion of waste land to the Anzac Memorial Park (1923) and the establishment of a historical society and an agricultural museum (1962, 1972). The Warracknabeal Herald (1885) is published twice weekly. Warracknabeal has State primary and secondary schools, St Mary’s Catholic school (1901), a Christian Community College and the Woodbine Training Centre for disabled children. There are six churches, one of the largest being Lutheran. Outdoor recreation includes the racecourse, the showground, a golf course, bowls, croquet, tennis and swimming facilities, Anzac park and a flora/fauna reserve beside the Yarriambiack Creek. There are three hotels, three motels, and a caravan park. The Yarriambiack shire offices are in Warracknabeal. In 1994 farming occupied 93% of Warracknabeal shire’s 1839 sq km. There were 202,000 sheep and lambs, 9700 pigs and harvests of 151,250 tonnes of wheat and 121,900 tonnes of barley. On 20 January 1995, Warracknabeal shire was united with Karkarooc shire, most of Dunmunkle shire and part of Wimmera shire to form Yarriambiack shire. In September 2010 and again in January 2011 many parts of regional Victoria experienced widespread severe flooding. In Warracknabeal the Yarriambiack Creek was swollen with floodwater and volunteers worked to shore up a 6 km levee around the town which stopped the town from being inundated.